Coronet 4-4 markII. Photograph gallery. I had wonderfully romantic notions, that perhaps it would take relatively good pictures, and I could eat humble pie. In view of the somewhat uncomplimentary remarks about this particular camera, I will concede that it does take pictures, the clarity of which are, shall we say - adequate. 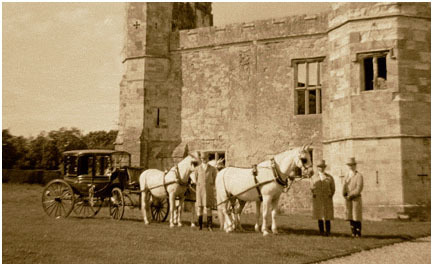 Fabulous Victorian coach, drawn by a team of Imperial White Lipizzaner Horses, at Titchfield Abbey, Hampshire, England.